Fire Emblem: Monshō no Nazo (ファイアーエムブレム　紋章の謎 Faiā Emuburemu: Monshō no Nazo?, Fire Emblem: Mystery of the Emblem) is a Japanese tactical role-playing game developed by Intelligent Systems and published by Nintendo. It was released in Japan on January 21, 1994. It was the first Fire Emblem title for the Nintendo Super Famicom and the first twenty-four-megabit cartridge for the system. The game is divided into two distinct parts, or books. Book One is a remake of the original Fire Emblem: Ankoku Ryū to Hikari no Ken, and Book Two is a continuation of events, following the same characters. 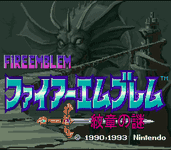 In 1996 KSS released an anime OVA, Fire Emblem, based on Monshō no Nazo. Fire Emblem: Monshō no Nazo was released in Japan on the Wii's Virtual Console service on December 26, 2006. A remake of Book 2 titled as Fire Emblem: Shin Monshō no Nazo ~Hikari to Kage no Eiyū~ was released in Japan on July 15, 2010, for the Nintendo DS. Source: Wikipedia, "Fire Emblem: Monshō no Nazo", available under the CC-BY-SA License.